Karun Chandhok is no stranger to the 24 Hours of Le Mans. The Indian racecar driver made his debut at the event back in 2012 in the LMP1 category, and followed that up with three years of racing in the event's LMP2 category. Which means that as a driver he's more than ready for the task of driving the LMP2 machine this year. And what a special machine it's turned out to be. 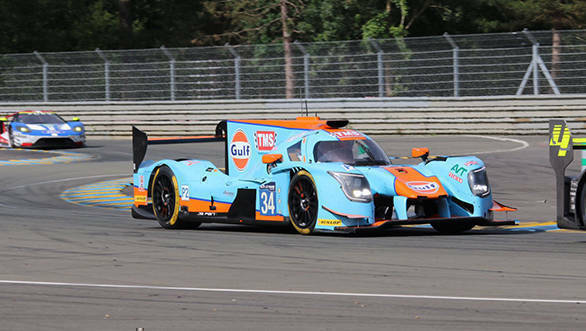 For the 2017 edition of Le Mans, Karun will drive the Gulf liveried Tockwith Motorsport Ligier JS P217. It comes at a special time too, with Gulf celebrating 50 years at the glorious 24 hours of Le Mans. 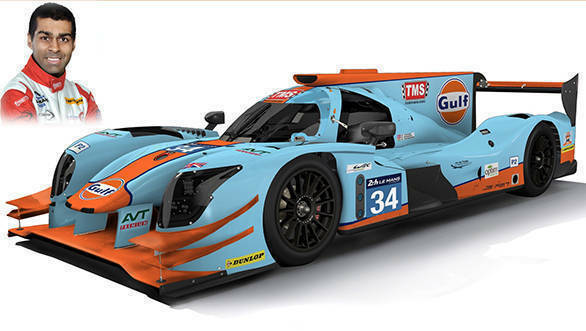 "It's very cool to be driving the iconic Gulf liveried car at Le Mans this year," Karun said. "The deal has all happened a bit last minute, but well done to the team for getting it done!" he said. And being the huge motorsport enthusiast that he is, in addition to being a racecar driver, Karun was rather thrilled about driving a Gulf liveried car on their 50th year at Le Mans. "There are few liveries in sportscar racing or indeed motorsport as iconic as this blue and orange, so it will be very special," he said. But once he's inside the car, there's certainly not going to be much time to think about liveries. For Karun, and for his team-mates at TMS, Nigel Moore and Phil Hanson, the goal will be to get their Ligier as far up the order as possible. Being the best of the LMP2 cars might be quite a task, but there's hope of course. For Karun, preparation for Le Mans began earlier this year with a stint in the T-Sport LMP3 car, that resulted in a podium for him and team-mate Steve Tandy. Of course, for the team, it was a huge help to have a racer with experience drive for them and help them learn as they made their entry into the world of sportscar racing. For Karun it was a way to shake off a little rust, given that he's been away from a racecar for a while. After that, though, it was straight behind the wheel of the TMS LMP2 machine at Spa. For the Tockwith team, and for Karun, Moore and Hanson, it was a tough outing. Competing in the 6 Hours of Spa, held as a part of the 2017 World Endurance Championship, was a way for the team to sort out any niggles that they had, get a good sense of working together, and make sure that they could work on things like the set-up of the car. While it wasn't an ideal outing, certain things became clear. The first was the fact that they were possibly at a disadvantage, given that the Oreca machines were clearly stronger than the Ligiers. When the trio of Chandhok, Moore and Hanson took to the wheel of the now Gulf-liveried TMS Ligier during the test day at Le Mans, things certainly looked up. Of the 60 cars that took part in the test session, the Gulf-liveried machine was classified 25th. Along the way the team was able to understand what it was that they could improve as a package. "We'll keep pushing," says Chandhok. "It's a 24 Hour race and a lot can happen. There are certainly things that can be improved as a package. So we'll keep trying and we'll get the result that we can at Le Mans!" he said. But getting ready for Le Mans moves far beyond just the team and the machine being prepared to take on rivals on the 13.6km long Circuit de la Sarthe. There's plenty that a driver needs to do too. And Karun's gearing up for exactly this, training hard to make sure that he's ready for the task of driving the Gulf-liveried TMS LMP2 car. The first thing that he says is vital, is physical fitness. This includes making sure that the one can survive upwards of three hours in the car at Le Mans, surviving the G-forces that come when racing at high speeds. In order to be fit, there's plenty of endurance training involved. For Karun this involves riding his bicycle for three hours and above. He says that it adds a mental advantage too, for if you know you can ride a bicycle hard over hills and the like for that long, you know you can survive a similar amount of time in a race car. There are other aspects too. This includes making sure that your dietary needs are taken care of. Karun carries his own food to Le Mans, so that he's able to eat exactly what he normally consumes at home - cereal, protein shakes, energy bars. And he fills up on fluids too - plenty of water and electrolytes are essential. There's another very vital aspect to consider. This is the fact that what fluids are to a driver's body, the engine oil is to the engine. The motor needs to run continuously and without a break for the duration of the race, which is why it's critical to have an engine oil that does its job perfectly - which is exactly where a high-performance engine oil like Gulf comes into the picture. Gulf Oil ensure no glitches and a top notch performance from your car engine for the daily drive, which also has its share of pressure situations, though nowhere near what the Tockwith LMP machine will go through at Le Mans. And while the engine in the car is running non-stop, it's the drivers who need to switch in and out of the car. The driver's role includes fitting into the team, making sure he is well aware of what is happening when, who is involved with what, and how and when he is able to eat and rest during the critical 24 hours. After all, between the 17th and 18th of June this year, Karun will get only 3.5 hours of sleep in total. 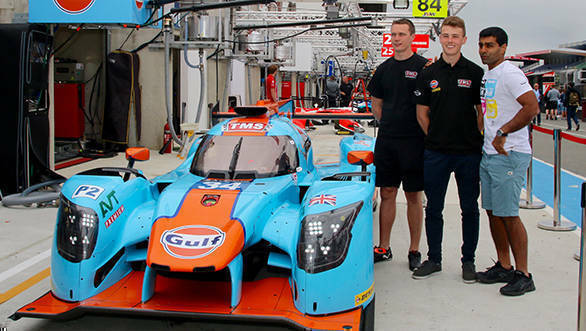 The rest of the time he's going to be driving the lovely blue and orange Gulf-liveried Tockwith Ligier LMP2 machine in what is the greatest motor race in the world! Stay tuned to OVERDRIVE for updates.